Changing your career at the age of 40 or midlife career change might be a very complicated decision, but one bold step might change your life forever. Certain questions might arise during that period like, “Is this the right decision for me?” or “Am I capable of doing this?” or may be, “Will I be able to continue with it?” etc. But ultimately your willpower works out and you say, “Yes, this is what I wanted”. A career switch is the opportunity to utilize all your experiences and skills that you have gathered all these years. This is the period when you can analysis yourself and your capabilities with the work that you’ve never done before. But there are certain things that you need to figure out before stepping into a new career. 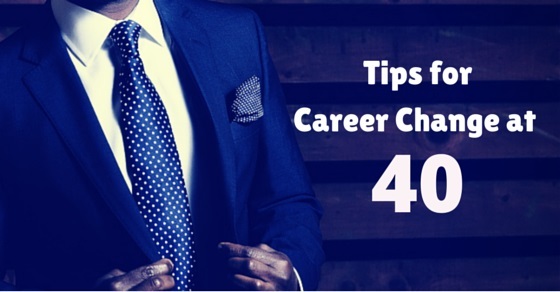 Here are few best ideas for career change at 40. The following mentioned are few tips on how to change careers at 40 and also good midlife career change ideas. The first thing that interrupts you for a career change is the fear and laziness to attempt for a new job. You might be scared of certain thoughts like finance, health, ability to work, etc. You need to avoid excuses especially such in order to proceed to your new life. To overcome the fear, you need to avoid the thought that makes you worried. People might try to demotivate you by telling failure stories but you need to stay firm to your decision. Avoid what people say because they won’t be benefited with your success in anyway. Stay strong and have the guts to leap with a positive attitude. To step into a new career you need to be financially strong and stable. Since this is a critical phase of your life you cannot rely on money by doing new experiments. So keep a backup of your wealth so that you can utilize it when something goes wrong. In case of entrepreneurship, you need a stable amount so that you can invest it to start a business. With the excitement and thrill to start a new interesting career, don’t just leap without any research or analysis of the job or business that you’re going to do. Stepping without a proper study might get you stuck and you won’t have any choice other than stepping back. So avoiding a good research might lead you to failure and stop your new career before starting. Career planning is very necessary before you start a serious work. This includes market research, promotion, strategy and goals. Plan about what you really want to do and how much do you want to achieve. Target your customers and then execute the plan accordingly. In case of a business plan, find a co-founder and share your ideas to plan it in a better way. Stop having imaginations and do things practically. Initiate the task to figure out what is required to do next. You can’t start a work by thinking over the consequences or the right and the wrong. People who have practically constructed a work are likely to gain success more rapidly. Take career advice from an expert or from a person who is experienced in a particular field. It’s better to learn from someone who is a expertise in a field. Understand the pros and cons of changing careers at 40 and what else changes it can bring to your life. Experts can advise you with the right ways to move towards a different direction. Questioning expands your knowledge and increases your chances to step a move forward. Ask your adviser about his expertise and how he utilized them in his career journey. Try to learn more about the career path that you’re going to follow. The more you question, the more you’re likely to gather ideas for your business. Job portals, newspapers and magazines are the platforms where you can find a number of work opportunities. So do not restrict yourself to browse into them. You might find your desired job from the hundreds of vacancies posted over there. You’ll be inspired to find the new career ideas and opportunities and won’t return empty handed. If you are still doubtful about your capability then go for an online career personality test. These personality tests bring out the result of your ability to start a new career and what you think about it. Although the test results don’t give clear suggestions but there are some that do. There are a number of free online career personality tests around the web that you can consider participating. If you are earning a low payout in your current job then it’s not appropriate for change of career to a different direction. Being very fickle minded and jobs inquisitively might make you lose all the facilities and allowances that you’re currently getting from your job. Your new career might bring you money but might not benefit you with all the current facilities. So think over it before you move. Suppose if you love computers then Google about it. There are several sites coming up with topics like computer repairing, laptops, computer trainer, etc. You can go through the relevant topics based on your search. This will give you some general idea about how to start a computer repairing store or similar other topics. Create a list of your priorities and choose career which will go alongside them. Suppose, if your priority is your family then you can start working from home as freelancer or consultant. Though it has few cons but also understand that it has several pros. This will give you the opportunity to stay beside your family and also continue with your new job from home. If your friends and acquaintances moved to the call center industry then don’t move there just because they did. Learn to judge what is right and which is wrong. You might also move to the call center sector but later you might face regrets because you’ll learn that this is not what you wanted. Always aim to be the unique. Following the crowd would make you an ordinary person just like the others. Do what your love and aim for your preferred destination. Explore new mid career change ideas and experiments to find out the right and wrong. Have you ever wanted to be that ‘something’? Then here’s your chance to prove yourself. Move ahead and focus on the career that you always wanted. Whether be it your own boutique or your own restaurant, it’s time to develop an all new yourself. Although you have collected enough skills and experiences till 40 years, but it’s time to achieve more now. With the establishment of a new career, you’ll get the opportunity to expand your skills. The more experience you achieve, the more your chances increase to move forward. Aim for the things that you could never achieve all these years and take the opportunity to enhance your skills and proficiency. The experience that you already have will motivate you to move forward. Although you are targeting to learn more, but also you should not ignore your previous experiences which is the root of your new career. So emphasize on the qualities that you already have and utilize them to step forward. Keep a connection with your contacts and take suggestions from them. There must be someone who can show you a path or help you with your new job. Or there must be a company person who can practically help you out with the business. Ask for some help or request them to introduce you with the key person of the company. Becoming an entrepreneur is a good career choice. In case you don’t opt to work as an employee anymore you can choose to start your own company. Utilize your skills and your money to start a company for something that you love. At least you’d be your own boss and you won’t need to follow any orders like you did till the last 40 years. Secondly, you won’t have a regular 9 to 5 duty and you can work with flexibility. So you can see that changing your career path even at 40 is not at all that critical as you think. Rather, moving to a new direction will give you a better vision towards life and enhance your skills and proficiency. Changing your professional life will also benefit your health from stress and the regular work schedule that you keep following on. If you are still thinking of moving your career then it’s time to quit thinking and handle it practically, because too much thinking with give birth to a new stress and also it wastes the time that you could utilize in initiating it.